The Doc’s say I’m doing well. It’s been a few months since the man called Nova sacrificed himself for the fate of the universe, and I have managed to stave off depression, agitation and a range of micellaneous withdrawl symptoms by flicking back through old issues of both Nova and The New Warriors, until Rich's next monthly gets a green light (resists urge to type out begging letter). 6) John Buscema Right from the start John had Nova nailed. With some of the best work of his career he set Nova's flight path on fire. 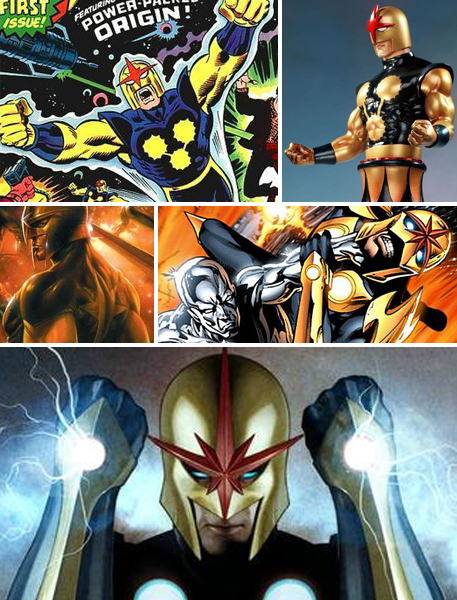 5) Bowen Designs The Nova range from Bowen Studios are some of the studios best Marvel work. Someone's obviously a BIG fan. 4) Gabrielle Del'Otto With this Annihilation teaser, I was glad I wasn't sitting next to anything electrical. This time Nova was no rookie! 3) Wellington Alves Originally #1 on this list, Alves' dynamic layouts made his take on the last Nova series fire on all cylinders. 2) Adi Granov Each Nova #1 cover has to literally fly off the racks. Had I ever produced one as good as what Adi delivered I would have followed it up with a beer and contently retired. 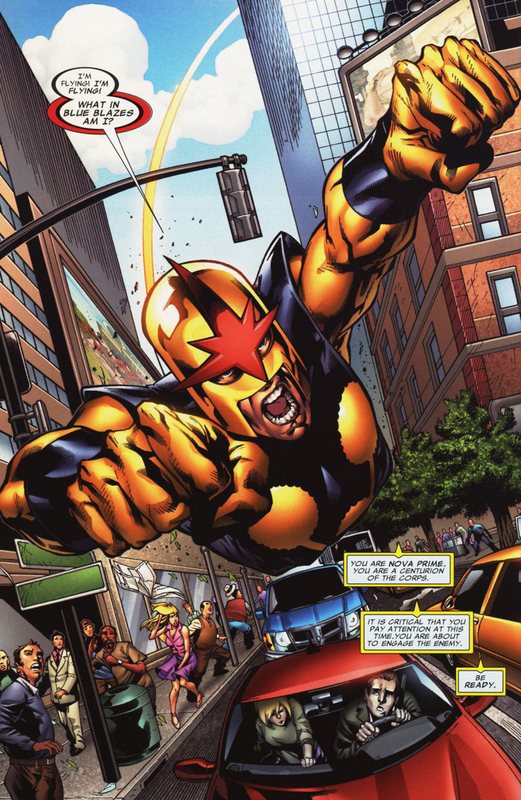 1) Mahmud A. Asrar Like Wellington, Mahmud really took flight in the pages of the previous Nova run. His kinetic style perfectly bridged Nova's earlier clean teenage looks with the slightly darker, more serious sci-fi hero looks he had recently embraced. In fact when Nova's next flight-plan does take off, there's no need to look around for a perfect artist - looking behind will do just fine. Who is your favourite Nova artist? PS - My own fave Nova artist is Andrea Divito, closely followed by Sal Buscema! Thanks for the comments Darren - and for the heads up on such a great link! That's some pretty great art you guys have got going down. Hopefully the readers will check it out starting with your own gallery (http://daz3333.deviantart.com)! Thanks very much for the reply my friend! Ref the comic. The team, all amateur artists and fans of Nova and Marvel Cosmic really enjoy the project - its quite international as we have contributors from the UK, USA, Canada, Spain, Brazil and as far as Asia - which just shows how much interest world wide the character has! Lets hope Marvel bring him back soon! i had a about a dozen Nova issues i found in the 3/$100 bins back in the early 80s. to me, John Buscema's pencils were virtually indistinguishable from his brother's Sal. in other words the art work was great which was among other reasons why i selected so many Nova issues when i had my pick of 3 for the dollar i was able to get from my dad from time to time. What a cool use of the internet Darren - it is always cool to see what a smaller place it makes this planet sized globe. Thanks for the links too! I miss thiose kind of bins David. I would love to go back-issue diving in my lunch breaks with that kind of price tag. These days it seems to rare. well Dan nice to see you've come out of hiding again. speaking of cosmic Marvel characters did you bloody well read Annihilators #2 yet? I sure have - personally as much as I love DnA I thought there would be a bit more BAM! to the mini series by now. I just thought there would be a bit more 'Annihilating' going down. Although the twists at the end as to who was responsible was pretty sweet.